Gadgets make the world go round ... okay maybe not the world, but my kitchen! Kitchen gadgets make a cooks job easier and most importantly, they save us time. To me, that means they are worth their weight in gold. You'll notice a theme with my gadgets. They all save me time and money. With Christmas just around the corner you may have those one or two people that are hard to buy for. 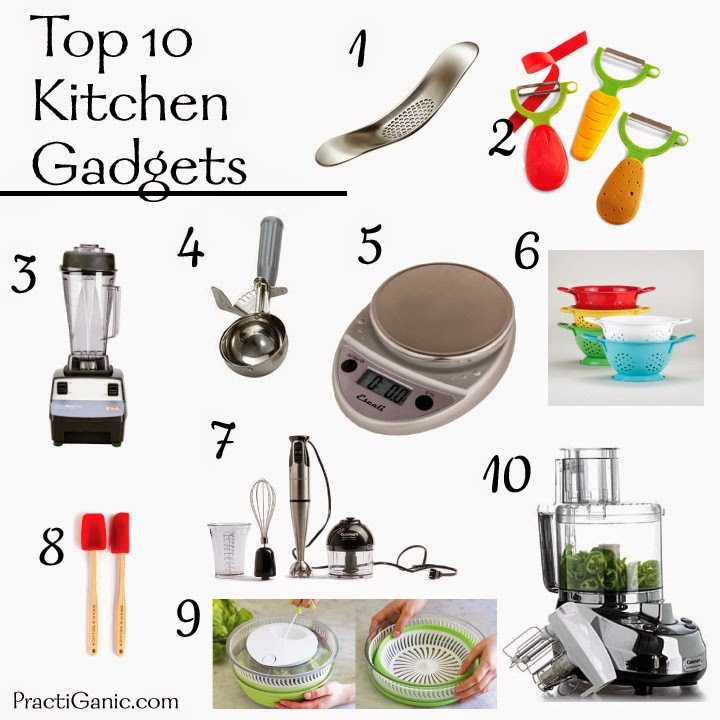 When in doubt, kitchen gadgets! They are fun and functional. You can't go wrong! Joseph Joseph Garlic Rocker $15: This thing is so fast and efficient for mincing garlic. Let's face it, the minced garlic that you buy in the store does not have the same great garlic flavor. It has to be fresh. This rocker goes really fast and saves time getting your garlic really small and time from cleaning the garlic off your hands! Y Peeler: My favorite is the Kuhn Rikon 3 pack of vegetable peelers. There is a potato peeler which is like your normal peeler. They have a tomato peeler that actually is gentle enough to peel a tomato and other soft fruits and vegetables. I use it the most for mangos! The third peeler looks like a carrot and it juliennes veggies. I love this for one for julienning carrots, zucchini, cucumbers, etc. This makes making spring rolls go super fast! You can buy them as a set for about $15 or if you just want one, it's $5. By the way, they stay sharp close to forever! VitaMix: I know what you're thinking, "Way too expensive!!!" That's what I used to think until we finally pulled the trigger! Wait until you have a 30% coupon from Bed Bath & Beyond, Kohl's or another department store and get one! Now, I realize that this thing paid for itself! Since we juice a lot, the VitaMix uses half the amount of produce as our old juicer. I also can make a lot more from scratch that I wasn't able to before like peanut butter, ice creams, etc. I have the low end, VitaMix 1300 and it does just fine for us. So ... pull that trigger! Thumb Press Food Dishers ... Old School Ice Cream Scoops. If you read my blog, you will know I'm obsessed with burgers. These make perfect, consistent burgers every time and it goes fast. I also love a small one for doing my faux meatballs. They also work out great for baking. Kitchen Scale: Recently, mine broke and I was seriously lost without it! Escali makes a lot of great ones for reasonable prices. Whichever one you decide to go with, read reviews and make sure that it can go to at least 15 lbs. (you won't regret it). Mini Colander: How many times do you bring out a great big colander for one can of beans or washing a handful of produce? It's so annoying! I love my little one can colander. I feel like it could stay on the counter sometimes it gets used so much. World Market is the place to pick these up. Only $2! Cuisenart Immersion Blender and Small Food Processor Combo: Again, another item that could sit on the counter. It's used for sauces, spreads, baby food ... everything! I love the tiny food processor that it comes with too. So handy to zip the motor onto it and go. Do you need the combo? Not necessarily, the hand blender alone is half the cost and that's really all you need, but the food processor gets used just as much and you don't need to pull out an entire appliance for doing a couple walnuts or breadcrumbs. Small Spatulas: One time when we were at the Mustard Museum, they had little spatulas for getting mustard out of the container. Genius! I bought a two-pack. Once I had them, I used them all the time! Most spatulas are just too big for getting around containers and really getting everything out. Now, I think I have about 6 small spatulas! If they're on sale, I can't say no! It's a small strange addiction. Don't judge me! Collapsible Salad Spinner: Getting all the dirt out of your lettuce can be a pain. Believe me, if you don't see it, it's still there! Wash all your greens, all the time! This salad spinner makes it really easy to do and I love that it's collapsible to save room in my cabinet. The bowl also doubles as a serving bowl and who couldn't use an extra bowl, right?! Food Processor - Small and Big. I am obsessed with my food processors. I have my small mini food processor, I also have a 7-cup and 14-cup. Because I make a lot of burgers and things in bulk, I need to have a great big one, but sometimes that's just overkill so the normal size is perfect. Is this excessive ... you betcha, but they get used all the time! This is something you don't want to skimp on too much. I have burned motors of cheap ones in the past. Find one with a good warranty! I like sticking with Cuisenart because this is what they are known for and they do a great job with them! Wooden Juicer: Just like minced garlic, lemon and lime juice HAS to be fresh!